Since we are planning to go to Kansas City this year for Christmas, we arranged to have Santa come to our house the Saturday before Christmas so the kids could open their gifts from us and so Santa could give them some of their gifts early. Saturday night, Paige helped Mommy to bake some cookies for Santa and they set them out with some milk. Paige also made a note for Santa with Mommy's help. On Sunday morning, they came downstairs to see all the presents. While we at Disney, Connor got Paige a princess bouncy ball and an Alladin figurine set. Paige got Connor a Goofy hat and a small Stitch stuffed animal. Before the kids dug too far in to the gifts, we remembered to snap a pic of them with the tree and the presents. 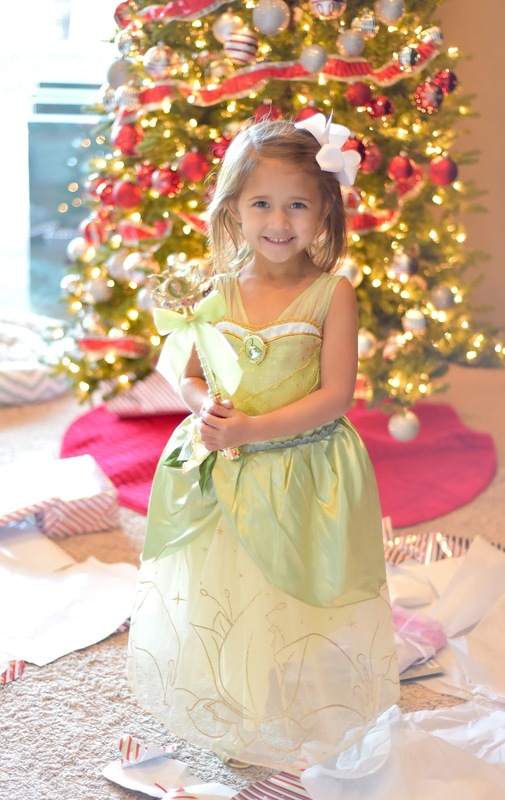 Santa brought Paige a Royal Princess Academy school and some new princesses. Connor got a new big orange bike with a handbrake. Mommy got the kids all kinds of fun stocking stuffers! So many that they were in separate bags. The thing Paige wanted most of all was a Pink Unicorn Pop-up pet. She was very excited to open it. Connor got a few stuffed animals and most importantly he got a new humongous Nerf gun! Paige was thrilled when she opened her new Tiana Princess dress. The kids posed for the last time this year with their elf Gin (he's in the tree). Gin has been visiting for a few years now and the kids loved looking for him every morning. After we got done with the presents, Connor dressed up in his new Nike outfit and blasted some Power Rangers (and some of Paige's princesses) with his new Mega blaster. I managed to get one picture just as the dart was firing. Both kids had a fun morning with their new presents! We're happy that Santa made a special trip out for us this year.